The frozen coastline along the Hudson Bay in Churchill, Manitoba sparkles from the yellow glow that the sun sends off across the landscape during a winter sunset. Blocking a portion of the sun, dark clouds begin to immerse the sky and the Hudson Bay coastline will soon be overcome by darkness. 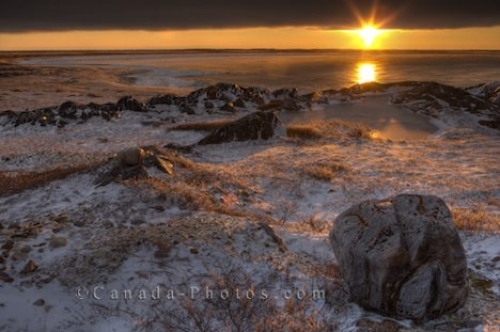 Picture of a sunset illuminating the frozen coastline of the Hudson Bay in Churchill, Manitoba in Canada.